Chinese stocks edged up 0.14 percent on Thursday in shrinking turnover, with Ping An Insurance gaining after announcing fourth-quarter results, lifting financial shares, while coal shares were soft. 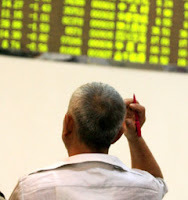 The Shanghai Composite Index ended the morning at 2,350.782 points after posting its biggest daily percentage drop in more than a month on Wednesday, falling 3.8 percent. Losing Shanghai A shares outnumbered gainers by 485 to 388, while turnover in Shanghai A shares shrank to 52.6 billion yuan ($7.7 billion) from Wednesday morning's 65.9 billion yuan. Ping An Insurance advanced 3.81 percent to 40.30 yuan as investors shrugged off its weak fourth quarter and focused on its more upbeat 2009 outlook. China's second-largest insurer posted a 1.34 billion yuan loss for October-December, hit by its investment in troubled Dutch-Belgian financial services group Fortis.